The Golden Spiral Or Golden Mean Informs Composition. The Golden Spiral Informs Composition. There is a benefit in reminding artists of the golden spiral principle of composition in their approach to their artwork, even though many will use it as a matter of instinct, born of long practice. Artists preparing to exhibit their work as part of the Go Troppo Arts Festival in Port Douglas were asked to keep this principle in mind as they explored ideas of celebration in the tropics. Mathematical ratios and proportions used in the golden rectangle, logarithmic spiral, the golden mean, the golden spiral or the fibonacci series - even the use of fractals - might be thought of as being the exact opposite of the exuberance and spontaneity associated with the subject of renewal and abundance as the Wet season approaches. But however spontaneous an artwork may appear to be, however elements such as rhythm, repetition and movement have been employed to imbue the work with energy, the starting point should always be a considered approach to its composition. The composition is the overall plan - the way in which elements of the painting, sculpture, music, poem or play shape the development of the artwork's construction. You wouldn't build a house without a plan - would you? Jack Heywood, well-known playwright and actor from Port Douglas, was discussing a play that he had developed for the Go Troppo Arts Festival in October. The play revolves around the life and work of Max and Diana Bowden, who came to Port Douglas in the 1950s. Max started the, now famous, Nautilus Restaurant and Diana established a flourishing shell jewellery business, supplying leading stores in Australia, as well as in New York and London. The Nautilus shell, hardly surprisingly, was the emblem used for both the restaurant and the shell jewellery business. The nautilus shell-fish is amazingly adaptive. As it grows, it seals off its former "living room" then adds another to fit its new size and so it goes on. The sealed chamber is gradually filled with gas, though a process of osmosis, enabling the nautilus to float near the surface of the ocean to feed at night or to sink to depths of around 300 - 400 metres. Because of this adaptive behaviour the nautilus is sometimes used as a symbol for renewal. The golden spiral in nature. So it was a natural step from discussion about the Nautilus play to thoughts about the classical approach to artwork - whether that be visual art, poetry, sculpture or theatre. It was decided that reminding artists of principles of creating harmony with focus might help to connect disparate events in the arts festival and to lift the overall quality of the work even higher. In Nature, the fibonacci series of relationships is evident when one looks at the way a tree branches, a flower, shell, pineapple or pine cone grows or a low pressure weather system whirls. This can be described mathematically as 0,1,1,2,3,5,8,13,21,34,55,89 and so on with each successive number in the series being the sum of the previous two. 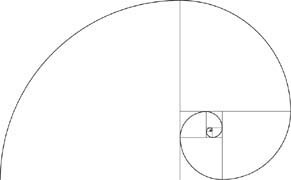 The golden mean, golden rectangle or golden spiral follow these principles, using the Greek symbol 'phi' or the relationship of one line or shape to another where the ratio of a part is 1 : 1.618. This is also described as an infinite pattern or the divine ratio. Fractals are a bit different, each image bearing a relationship to each other in various orders of magnitude, but also based on laws of nature. Jackson Pollock, as we know, used fractals in his huge paintings, which seem to have been developed almost instinctively. What is a golden spiral? The golden spiral develops from the golden rectangle, where the sides of the rectangle bear the relationship of phi - in other words if the height of the rectangle is 1, then its length is 1.618 or thereabouts. 1. Make two small squares, exactly the same size. 2. Place these side-by-side and make another square, whose length is the same as the length of the two smaller ones joined together. 3. Now make another, larger square, the length of which is the same as the length (or width!) of squares 1 and 2 joined together. 4. Make yet another, larger square, the length of which is - you've guessed it - the same as the total length of squares 2 and 3. 5. 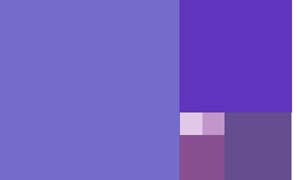 Yes - keep going in the same pattern - 0,1,1,2,3,5,8,13...until your canvas is as large as you want. If you mark the squares or intersections on your canvas or paper as you go you will then have reference points for focal points of your (rectangular!) painting. Have fun!